The up-coming 2014 is full of anticipation and excitement. With a huge amount of new styles new colors coming in, we're happy to finally introduce you to our 4 new colors – Ice Green, Flamingo, Azure, and Pink Flash. Super fresh, bright and vibrant, we want vivid colors with lots of energy and a pop of color that stands out, but not completely over-the top like NEON. More importantly, we wanted to add colors that are trendy and fashionable; colors that could be worn for any occasion, anytime, anywhere. We added these 4 new colors in total to 52 styles, 39 which are new and 13 existing. 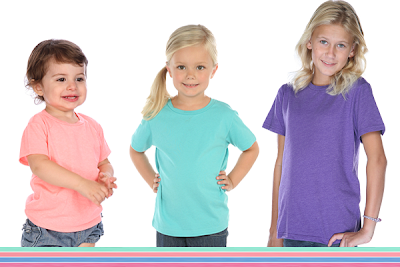 Popular styles like our junior tanks, tees and even adorable infant baby and girl's dresses from our divisions got these new colors. Let's take a SNEAK PEEK! At what's coming in this season, which styles are already available and to definitely keep an eye-out for. If you're into the basic tank, than our most popular number is the Racer Back Tank. It's form fitting with a fun racer back detail, making it the perfect piece for layering in any outfit. Or if you're looking for something that's trendier? Check out our other tank top favorites, like our Flowy Tank and our High-low tank tops! Now available in all 4 BRAND NEW colors - Ice Green, Flamingo, Azure and Pink Flash. In-stock NOW and ready to ship! Also, our most popular basic tee is now available in 4 brand new colors. Super-soft and essential staple must-have, it's the definite definition of the anytime and anywhere kind of top. We have tees available in sizes ranging from 6M babies all the way up to 2XL Women's, and all other sizes in between. Available now in new colors for Junior's & Women's crew neck tees and Junior's & Women's v neck t shirts. As well as, Infant's, Toddler's, and Youth basic crew necks for boys and girls! Most, now in stock and ready-to-ship! Our popular burnout baby doll dress for infant's and toddler girls will also be available in these 4 brand new colors! These adorable dresses can't come soon enough! The new colors will be a sure hit, on these baby burnout dresses. Also, we couldn't forget the little ones! Our #1 babyonesies, gets a piece of these new colors as well. Available in 2 colors: Pink Flash and Flamingo the baby Lap Shoulder Bodysuit one piece is in-stock now! Burnout Dresses Are Expected to arrive by late December for the upcoming 2014 Spring Season. Being able to offer these 4 great colors is something we've all been waiting for. It gives a fresh update on the products that we offer and also who doesn't love choices and varieties?